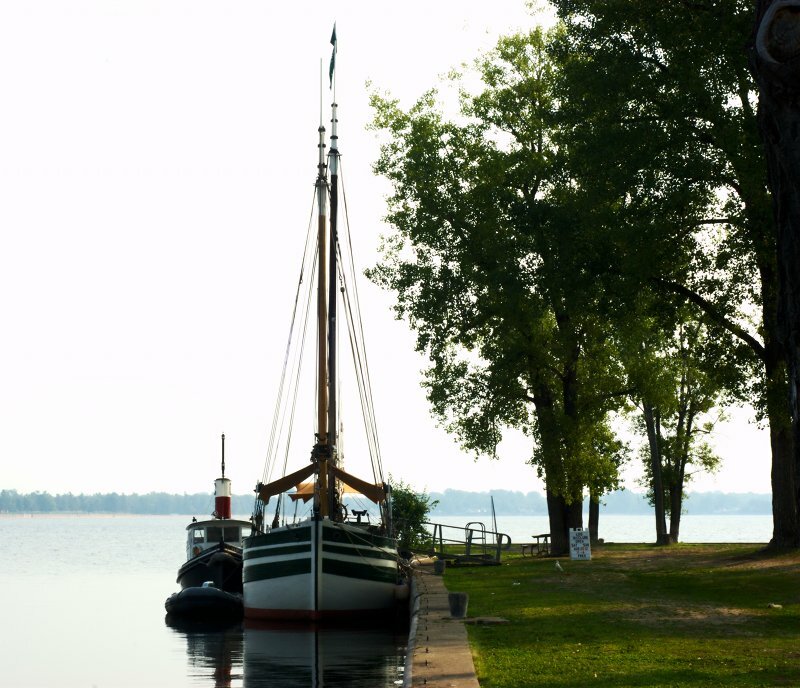 The Bicentennial tour, 1812: Commemorating the War, Celebrating the Peace began, as it should, with a visit to historic Plattsburgh, NY on June 2nd & 3rd. It was Clinton County “Museum Days” weekend, where the public is invited to visit all the museums in the area and with the support of the Lake Champlain Basin Program and Museum Days organizers, we joined in as one of the stops. We returned to our now familiar dockage at Wilcox Dock and got ready to receive visitors. Mr. Wilcox had been an active coal dealer and regularly imported coal shipments via canal boat to provide heat to the North Country. When the “new” New York State Barge Canal was being engineered in the early 20th century, the Wilcox Dock was incorporated into the system as a canal terminal. Today it is a lovely waterside park complete with boat ramp and fishing access. When we arrived there I decided it was a good time to see if our old friend Captain Theodore Bartley had ever had interaction with Mr. Wilcox and so I went to our new, indexed (thank you Barbara!) edition and examined the record. Not surprisingly, it directed me to an entry when Captain Bartley was delivering a boatload of coal for Mr. Wilcox. On further inspection, I was struck hard when I read that this delivery had taken place on June 2, 1888, exactly 124 years to the day earlier. Captain Barley never disappoints and never ceases to amaze me in how much his experiences and writings enriched our understanding about canal life in the 19th century. When Saturday morning came, we had a surprise early visitor stop by bearing gifts. It was Mayor Don Kaspersak coming to welcome us and thank us for our participation with a big box of donuts for the crew. Don made us feel very welcome indeed. As the day progressed, visitors began to arrive and over the two days we welcomed hundreds of people aboard. It was great to see many old friends and so many folks who had never been on the boat before. As usual, there were lots of kids with grandparents and parents and that always makes our crew happy. On Sunday morning I went to the Kent-Delord House Museum, a wonderful early historic home once used by the British as their headquarters during their brief occupation of the town in 1814. Macdonough’s shocking victory and the stiff resistence of Vermont and New York militia made that occupation very short-lived. I had gone to visit my long-time friend, historian John Kruger, who now serves as its director. The historic home contains a wonderful collection of historic materials, among them, a portrait of Commodore Macdonough presented to the Delord’s by Macdonough himself at a post-Lake Champlain victory dinner hosted by them in his honor. It was great seeing John and I was especially touched when he made me a gift of My Duty Is Here, the Civil War Journal and Letters of Rev. Francis B. Hall, a wonderful memoir of letters written to his wife and part of the museum’s collection. It moved to the top of my reading list and has added a greater understanding of the life and times during that National conflict and when the schooner was in operation. As Sunday afternoon began to wind down and heavy weather predicted our crew prepared to cross the lake and return to Burlington. That one-week stay would be our final week of preparation for the next 4-months of our 1812 journey. In leaving Plattsburgh it seemed only fitting that we should begin this three year commemoration there, the place where the War of 1812 finally pivoted in a decisive way toward the American side, and a community that will feature large in our final chapter of interpretation of the War of 1812.